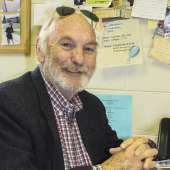 Mike Hendricks recently retires as social science, criminal justice instructor at McCook Community College. The implosion of the Riviera hotel in Las Vegas this past week brought back a lot of fond memories for me as I'm sure it did for some of the readers of this column. The last time Coach Bonow and I went to Vegas, we stayed at the Riviera. And although it was worn and showing its age, you were reminded of the class it and others like it exuded in their prime. My favorite story involves a decision we made one day to walk over to the Hilton to watch and perhaps make a bet or two on some horse races. I had almost gotten to the front door when I turned around to say something to Bonow and he wasn't there. I stopped in my tracks and started looking around the hotel for him and finally spotted him waving at me from the service entrance to one of the restaurants. He motioned me over to where he was and when I got there, he told me he knew a short cut to the Hilton. Since it was a little past noon and already 100 degrees outside, a short cut sounded good to me so I followed him. We walked through the kitchen where scores of employees were busy cooking and preparing meals for their customers to the back door and out. The back door opened out onto a parking lot for hotel employees that must have been a half mile long. We walked the length of it until we got to the entrance and when I looked up for the Hilton, it was obvious we were further away than I was when I was at the front door. In an agitated manner, I looked at Bonow and said his name loudly to which he replied by spreading his arms widely and in a very innocent tone said, "Why do you listen to me?" The Riviera was only the most recent old classic hotel to be demolished in recent years. Before the Riviera, we saw the Frontier, the Stardust, the Castaways, the Desert Inn, the El Rancho, the Aladdin, the Hacienda, the Sands, the Landmark, the Dunes and the Sahara all destroyed. These hotels, along with the still standing Caesars Palace and Circus Circus, comprised the Las Vegas I was introduced to as a young man and quickly came to love. The Dunes was especially dear to my heart because it was the essence of old Las Vegas. Back then the Vegas strip was run by the Mafia and ran in a way most people who have only heard of the Mafia would never expect. The Mafia bosses and their underlings had class and insisted that everything about their hotel and casino operations exuded class too. These were the days of the $1.99 all-you-could-eat buffets and $29 rooms. They made everything they were responsible for highly affordable, even cheap, because they knew they were going to get your money on the gambling tables or the slot machines. Today nothing is cheap in Vegas because the corporate heads that run Vegas today want your money at every opportunity they have to get it; a stark departure from the way it used to be. Shows were also totally different then than they are now. I saw Frank Sinatra at the Dunes, Steve Lawrence and Eydie Gorme at the Hilton, Robert Goulet at the Sahara, and Elvis at the Hilton and there was no Ticketmaster back then. You simply slid some green into the hand of the Ma"tre D' and he took you to a seat that reflected your donation. There was always a dinner show and a late show and the dinner shows were extravagant and delicious. It's hard to find a dinner show OR an attending Ma"tre D' today. Speaking of dinner, I usually ate at the Top O' The Strip restaurant, located on the 24th floor of the Diamond of the Dunes hotel tower and was always recognized and treated like royalty when I was there because the mafia treated regular people like kings and queens. If you were honest and weren't trying to run a game on them, they would bend over backwards to make sure you had a trip to Vegas you would remember for a lifetime. Of course it was a different story entirely if you were trying to beat them at their own game by cheating them or ripping them off. If you were, they didn't call the police, they just handled it themselves. This was the part of the mob that people didn't like but it was very effective at keeping order and making sure that the regulars would return to Vegas again and again. The Dunes was demolished several years ago to make way for The Bellagio and the Bellagio continues to occupy the same property that the Dunes did before it. The Dunes was built in 1955 with Mafia and the Teamsters pension fund and was owned for many years by Morris Shanker who was associated with the St. Louis Mafia. I had the pleasure of getting to know him and he always treated me with dignity and respect. The mafia did some bad things during their heyday in this country but in my opinion, the way they ran Las Vegas wasn't one of those things. It was a thrill, even a privilege, to go to one of those classic hotels and casinos back in the '60s and '70s and be treated like you were somebody which certainly doesn't happen today unless you're one of the whales who bring boatloads of money to wager in Vegas. The theory back in the good old days was to take good care of everybody because that would bring them back again and again and if you're getting everybody's money, that's better than singling out a few rich guys. That philosophy is no longer practiced in Vegas and, in spite of the new and glitzy hotels that line the Vegas Strip today, the town is only a shadow of its former self because of it. I have been going to Las Vegas for 30 years. The first Hotel I stayed at was the Riviera. I took my Mom to Las Vegas 20 years ago and she was disappointed. She had the House Band at The Vapors from 1969-1979 and spent some time rehearsing in LV back in the day (she is on youtube - Ellen Kennedy Marsh). I enjoy the current iteration of LV. We eat at the best restaurants in the world and stay at a discount at 4 and 5 star hotels. I kind of miss staying at the IP or the Riv and Slots of fun But Aria and Wynn and Mandalay Bay are fun. What is miss most is Tom Jones. For sure times have changed and to your point almost every time we go we comment on the old days and how they seemed more generous to the customer and appreciated.